Get ready for all the Venom movie quotes, trivia, and cast info you can handle! On October 5th , fans everywhere will get the chance delve deep into the backstory of one of Marvel Comics‘ baddest baddies. If you love a good origin story as much as I do, you’ll be first in line to catch Venom when it releases! Until then, read on to learn everything about the movie…and the talent behind it! Venom is an upcoming action, horror, sci-fi, superhero movie that is based on the Venom character from Marvel Comics. 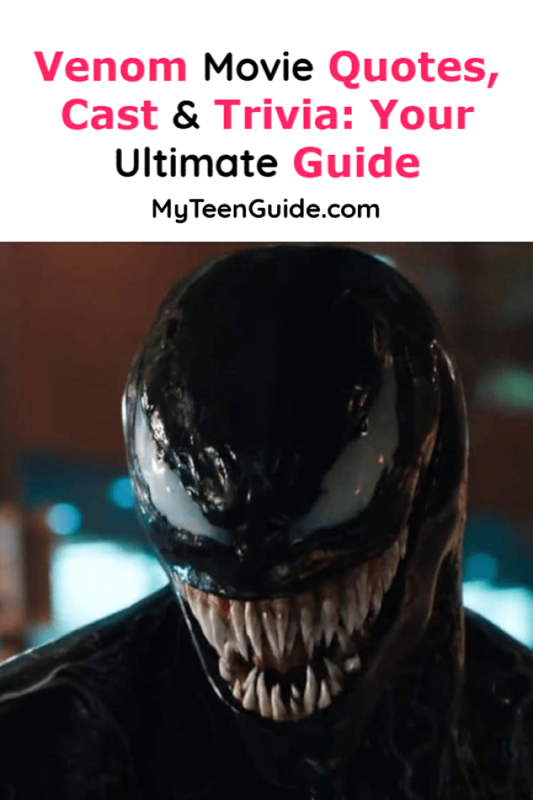 The movie focuses on Eddie Brock, a journalist who comes into contact with an alien, parasitic Symbiote and the two bond together, creating Venom, a grotesque and repulsive vigilante. I have to say, Venom always gave me the creeps! While Redditors are pretty vocal about Green Goblin ranking as the #1 arch-nemesis of Spidey, with Doc Ock following as a close second, you really can’t count Venom out of the race. Read on to learn about the cast of Venom, then check out some great quotes & trivia! Don’t forget to sign up for a Fandango Fan Alert so you can be the first to grab tickets! Tom Hardy as Eddie Brock/Venom. Eddie is an investigative journalist who is looking into the harmful human experiments of the scientific company- The Life Foundation. Who doesn’t love Tom Hardy? He is one of my favorite actors. Hardy has won 2 British Independent Film Awards for Best Actor. First, for his role as Michael Gordon Peterson/Charles Bronson in the 2008- Bronson. Second, for his role as identical twins Ronnie and Reggie Kray in the 2015- Legend. Anne is Eddie’s girlfriend, who is employed by a firm that has ties to The Life Foundation. Williams has won a few awards for Best Actress for her role as Marilyn Monroe in the 2011- My Week with Marilyn. These include a Golden Globe Award, an Independent Spirit Award and a Hollywood Film Festival Award. She also played in Brokeback Mountain, one of my absolute favorite movies, and she did such an amazing job playing the role of Alma in that movie. This is out tomorrow on newsstands. It’s rare for an interview and photoshoot to really show you yourself, but the insightful and relentless @carvell_wallace did this by opening the interview with “What is your purpose here on this earth”, and with his camera @sharifhamza made good on our goal of transcending the binary way that brown men are often portrayed in our culture (either aggressive or passive) to communicate both the strength & vulnerability of our shared experience growing up as British Muslims. Thanks @nytmag for what felt more like an experience of self reflection than ‘promo’. And thank you to Navina Haider at the Metropolitan Museum of Art, Islamic Art Dept, for your generosity, wisdom, and warmth. Grab a copy. Blake is the head of The Life Foundation; a scientist who dislikes humankind and has a fascination with symbiotes. Ahmed is well-known for his role as Naz Khan in the 2016 television miniseries- The Night Of. In fact, he has won a few Best TV Lead Actor awards for his role, including a Gold Derby Award, an Online Film & Television Association Award and a Primetime Emmy Award. (I have never seen any of his work, but judging from the movie trailers, he seems like he has a great deal of talent. What do you guys think)? Skirth is a scientist working at The Life Foundation. Slate is probably best known for her voice role as Tammy Larsen in the animated television sitcom- Bob’s Burgers . Also, she won the Critics’ Choice Movie Award for Best Actress in a Comedy, for her role as Donna Stern in the 2014- Obvious Child. (She is another one whose works I haven’t seen, but again, from the looks of the movie trailers, she looks like a pretty good actress). Pick up an exclusive #Venom art print in celebration of @FreeComicBookDay​ and Venom​'s 30th anniversary while supplies last today. Link in bio for participating locations. If the trailers are any indication, this is going to be a sell-out movie! The trailers have an epic number of views! Venom’s first movie trailer, released on April 23, 2018 by Sony Pictures Entertainment has received 68,515,411 views to date. The second movie trailer, released on July 31, 2018, also by Sony Pictures Entertainment, has received 34,600,766 views to date. According to Box Office Pro predictions, Venom could potentially gross between $60 million and $85 million at the box office on its opening weekend. This would make it the biggest domestic movie opening in the month of October. Currently, that title belongs to Gravity, released on October 4, 2013 with a domestic gross of $55,785,112, according to The Numbers. Give props to the original Venom, please! Tom Hardy isn’t the first actor to play the role of Eddie Brock/Venom. Topher Grace played the role in the 2007- Spider-Man 3 . Grace also played Eric Forman, the main character in That ’70s Show . Fun fact, there are only two degrees of separation between Topher and the cast of Venom, according to the Oracle of Bacon. He played in a movie with at least one actor who, in turn, played in a movie with each of the four main characters. Head’s up, if you visit the 6-Degrees generator, be prepared to go down the rabbit hole! I can spend hours finding links between actors, trying to stump the Oracle! Not the first time playing a super hero! This is the second superhero-themed movie that both Tom Hardy and Jenny Slate have appeared in. Both were in DC Comics Batman films. Slate did the voice of Harley Quinn in the 2017- The Lego Batman Movie . Talk about an award-winning cast! The #Venom cast presented exclusive film footage at #CinemaCon2018 last night. Swipe through the gallery for more. The Venom cast includes 2 Academy Award nominees- Tom Hardy and Michelle Williams. Hardy has received 1 nomination for Best Supporting Actor for his role as John Fitzgerald in the 2015- The Revenant . Williams has received 4 nominations. She received 2 for Best Actress for her roles as Cindy Heller in the 2010- Blue Valentine and as Marilyn Monroe in the 2011- My Week with Marilyn. She received 2 for Best Supporting Actress awards for her roles as Alma Beers Del Mar in the 2005- Brokeback Mountain and as Randi Chandler in the 2016- Manchester by the Sea. Are you crazy excited for this Marvel villain movie? Have you heard any other great Venom movie quotes or trivia? Share below!